Serbia: A New Mediator In Ukraine Conflict? BELGRADE, Serbia -- Serbia takes over the presidency of the OSCE in 2015. Providing a solution to Ukraine crisis is a top priority for the organization. Will Belgrade, with its good relations to both East and West, be able to mediate? Serbia's political class has never been known for modesty. And once again, it has set its sights high with its decision to take over the rotating presidency of the Organization for Security and Cooperation in Europe (OSCE) in 2015. Belgrade saw a unique chance to set up a conference celebrating the 40th anniversary of the Helsinki Final Act in order to brush up the country's tarnished foreign policy image. At the same time, it was hoped that such a conference might enable the presidents of Russia and the US, Vladimir Putin and Barack Obama, to get closer to a solution to the Ukraine crisis. Those hopes are linked to the particulars of Serbia's current situation. On one side, Belgrade is an EU accession candidate and officially champions a clear pro-European political course. 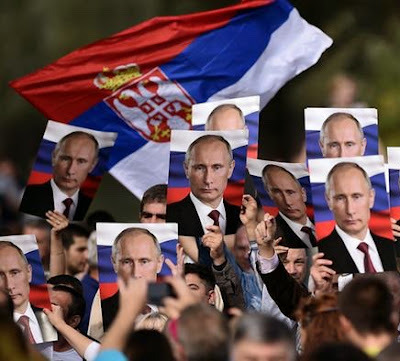 Then again, the leaders of the Balkan country have endeavored to strengthen their traditionally close ties to Russia - the reason why Belgrade chose not to support the EU's sanctions against Russia. As a sign of this support, it organized an elaborate military parade and joint maneuvers with the Russian army to coincide with Putin's visit to Belgrade in October (seen above). This dual position could be Serbia's asset in the Ukraine crisis. "Having good relations with everybody helps - Belgrade [is able] to play the role of an honest mediator," said OSCE Secretary General Lamberto Zannier. "A neutral country always gets complaints from both right and left - but it also creates a space for a contribution," Zannier told DW. Serbia was destined for the role of mediator, said Dragan Simeunovic, a political science professor at the University of Belgrade. "Not only does the country nurture good relations with both parties to the conflict, but it also has experiences of its own, namely the violent breakup of the former Yugoslavia and the secession of the former southern province of Kosovo, resembling the current situation in Ukraine." In an interview with DW, Simeunovic added that Serbia could not be the country that makes the decisions, but could nonetheless make an important contribution to peace. But this view is not shared by Dusan Reljic, an expert on Southeast Europe and the director of the Brussels office of the German Institute for International and Security Affairs. "Major European powers such as France and Germany engage in direct dialogue with Moscow. They don't need any mediators," he told DW. "Small states such as Serbia, which faces its own challenges in the areas of domestic and foreign policy - Kosovo coming to mind - as well as economic difficulties, are unable to contribute much to the solution of global problems, even when they hold the rotating presidency of the OSCE." Finding a diplomatic solution poses a challenge which so far has frustrated much bigger players than Serbia, as neither Moscow nor Kiev are inclined to abandon their positions with respect to the core issue of the conflict - the status of Crimea and of the embattled Luhansk and Donetsk areas. "At the moment, both Moscow and Kiev are still rather recalcitrant," said Simeunovic. "Both sides feel that they're right and are convinced that they will ultimately win. These are unfavorable premises for finding a solution." Although the OSCE thus far has been unable to provide significant input, Reljic believes that there is no better platform for dialogue between the US, Europe and Russia. "For a long time, the West has treated the OSCE like some kind of diplomatic fireside chat. Despite serious political upheavals - such as NATO's intervention in Serbia in 1999, or Russia's intervention in Georgia in 2008 - Russia was not thought capable of revoking the general consensus with the West reached after end of the Cold War." But now, Reljic continued, the highest hopes for a return to normality appear to be linked to the OSCE. With all sides calling for a diplomatic solution to the conflict, the OSCE is markedly confronted with the gap between rhetoric and deeds. Although the organization has officially been endorsed for one year by Ukraine, Russia, the EU and the US, the fighting continues on the ground in eastern Ukraine. A ceasefire has been declared a number of times, but it hasn't stuck. "The OSCE can facilitate, but it must be the actors themselves who contribute to the de-escalation." This is the sort of mealy-mouth language that concerns me greatly. There is only one side in this that is right and one side that is wrong. There is an unprovoked aggressor and there is a peaceful country wanting to go its own way. What good are "mediators"who start off with a premise of moral equivalence, when there is no moral equivalence? I'd be very surprised if Serbia - a long-time client state of Russia and infatuated with Putin - will take a fair and honest course in this conflict. Time will tell.